HÀ NÔI — The Department of Preventive Medicine under the Ministry of Health warned yesterday that flooding and rains in central and northern provinces could trigger disease outbreaks. According to the department, the heavy rains and floods that hit the country last week arrived at the peak time season for diseases such as dengue fever, malaria, typhoid and the flu. Garbage and waste overflow, borne along by floodwaters, cause pollution and diseases. To prevent diseases during the rainy season, people need to observe best practices for food safety and wash hands with soap before and after processing food and going to the toilet. People should wash daily, use mosquito nets even in daylight and wash and dry feet after walking in floodwaters or other contaminated water. People are also advised to kill larva and mosquitoes by covering water containers and wells and using chemicals to sterilise domestic water after floods recede. The Ministry of Health issued a letter asking health departments in northern and central provinces to carry out disease surveillance by sending mobile teams to flood-hit areas. Additionally, the sector must provide chemicals for each household to disinfect water sources. Local health officials should be particularly vigilant about diseases such as diarrhea, pink eye, influenza, cholera, dysentery and typhoid. Residents in flood-hit areas should also eat boiled food and water. The Preventive Medicine Department also said that local officials should provide information about diseases and preventive measures to people living in affected areas. Northern Hòa Bình Province, which was badly affected by the flood and rains for last days, has sent teams to districts and communes to inspect environmental and hygiene conditions. The provincial preventive medicine department readied quarantine measures to address potential disease outbreaks in affected areas in Tân Lạc and Đà Bắc districts. The province’s 21 clinics were badly affected by the flood. The Ministry of Health gave the province 2,000 lifebuoys, 200 life jackets and 250,000 cloramine B tablets (chemical sterilisation). 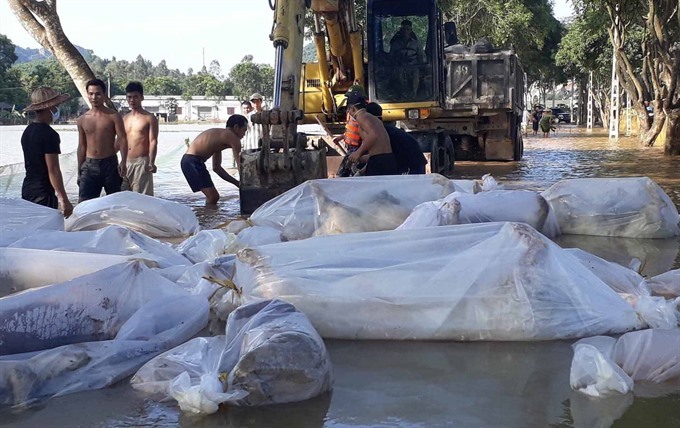 Yesterday, head of Natural Disaster Preparedness Department of the Ministry of Agriculture and Rural Development, Nguyễn Đức Quang, asked flood-hit provinces and cities to double down on efforts to rescue injured people and search for the missing. Additionally, the local authorities must regularly check residential areas at risk of landslide in order to make evacuation plans in time. Inspections of dikes, dams, reservoirs and transport systems must be undertaken to cope with future floods and storms, said Quang. As of yesterday, the floods in central and northern provinces have killed 75 people and injured 38 others. Twenty-eight people remain missing.